Last year many of you generously supported Wadi Foquin’s vision to build a soccer field. Residents cleared and leveled the ground this summer in preparation for seeding the field, and village leaders planned to hold a grand opening with children, youth, and families at the end of summer. 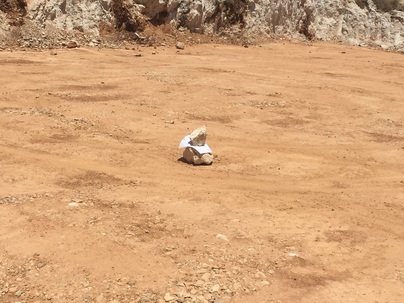 But on July 21, 2015, Israeli Civil Administration authorities left a notice under a rock in the middle of the prepared space ordering a stop to construction of the soccer field, signaling continuing efforts by Israeli authorities to annex village land. Just one month earlier, in June 2015, a group of Israeli Defense Force (IDF) soldiers entered the village with 20 laborers and earth-moving equipment and destroyed 1,300 fruit trees belonging to farmers of Wadi Foquin. These trees were within the 1,000 acres of Palestinian land in the West Bank declared by the Israeli Civil Administration in August 2014 to be “state land.” If successful, this annexation would be one of the largest expropriations of Palestinian land in the past 30 years. Several residents of Wadi Foquin have also been issued eviction notices, but they continue to hold out hope that the land confiscation orders will be rescinded. Significant portions of land in Wadi Foquin have already been annexed through the development and expansion of the illegal settlement of Betar Illit on the east side of the village. Betar Illit now houses over 50,000 settlers, dwarfing Wadi Foquin’s estimated population of 1,300. Ahmad Sokar, mayor and head of the village council of Wadi Foquin, believes that the latest annexation by the Israeli authorities is intended for the creation of an industrial and commercial zone serving the settlement community. Creation of this zone would effectively surround the village with Israeli development. Construction of the soccer field has been supported by fundraising through the United Methodist Church led by the Friends of Wadi Foquin, a partnership established with the village in 2009. Through our advocacy efforts, the U.S. Consulate in Jerusalem visited the village following the destruction of the fruit trees and filed a report with the State Department, but we have heard no follow-up on that report. In the meantime, congressional attention on the Middle East has been focused on the passage of the Iran Agreement. While we support the Iran Agreement, we also cannot allow what is taking place in Wadi Foquin to go unchallenged. 2. call on Congress to withhold foreign aid to Israel until accountability is established.